On the east side of the church there is a garden of remembrance wherein the ashes of the faithful have been interred. While we do not mark in the garden in any permanent manner where the ashes are interred, there is an opportunity to have a plaque erected on the wall facing the garden. 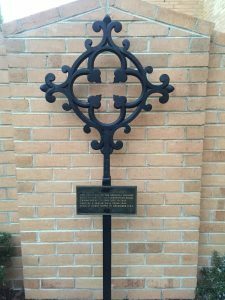 At the south end of the garden there is a memorial cross which was taken from the original church building, which burnt down in 1966. 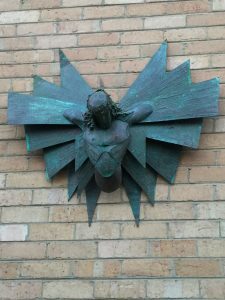 The sculpture is by parishioner and renown artist, Ray Jones. It is on the wall facing the garden. Please make contact with the Vicar if you would like your or a relative’s ashes interred.